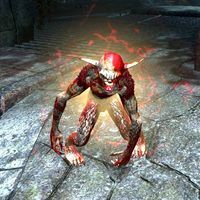 Cunning Scamps are unique Scamps who randomly spawn in the Imperial City Sewers, similar to Trove Scamps, though are slightly rarer. They can be distinguished by their red and white glow and do not attack. Instead, they will quickly run a certain path through the sewers and nearby many other enemies, seeking to alert them by having them see you. If they see a player, they will quickly try to exit the sewers by taking a portal, and should be stunned or killed before they can go through it. When they reach the end of their path, they cannot be stunned and will attempt to use their portal again, but can still be killed beforehand. It is suggested to have more than one person attacking a scamp to kill it faster. Scamps can be around for approximately 25 seconds before despawning, and have varying timers for when they will respawn, depending on the sewer section. Upon death they drop a satchel containing a set number of Tel Var Stones when opened, as well as a varying amount of Tel Var that is instantly added to your character. Anyone who does damage to a Scamp can loot it after it is killed, regardless of alliance. If one is in a group and does not do damage to it, but their teammates do, they can loot the Scamp if they were close enough to it when it died. Scamp often don't spawn in the same room twice in a row, but it can occasionally happen. Cunning Scamp Seeker 10 Kill 1 Cunning Scamp while adventuring in the Imperial Sewers. Cunning Scamp Slayer 15 Kill 50 Cunning Scamps while adventuring in the Imperial Sewers. Cunning Scamp Exterminator 50 Kill 100 Cunning Scamps while adventuring in the Imperial Sewers. Some Scamps in the Irrigation Tunnels and Lost Tombs section of the Abssyal Depths may despawn too early, can run at higher speeds, and may sometimes not be targetable by abilities. Their timers are also bugged, delaying their spawn times by a long amount. They may not appear with the red shader applied. This page was last modified on 20 January 2019, at 21:52.